An Avid edit system bin filled with AMA clips. 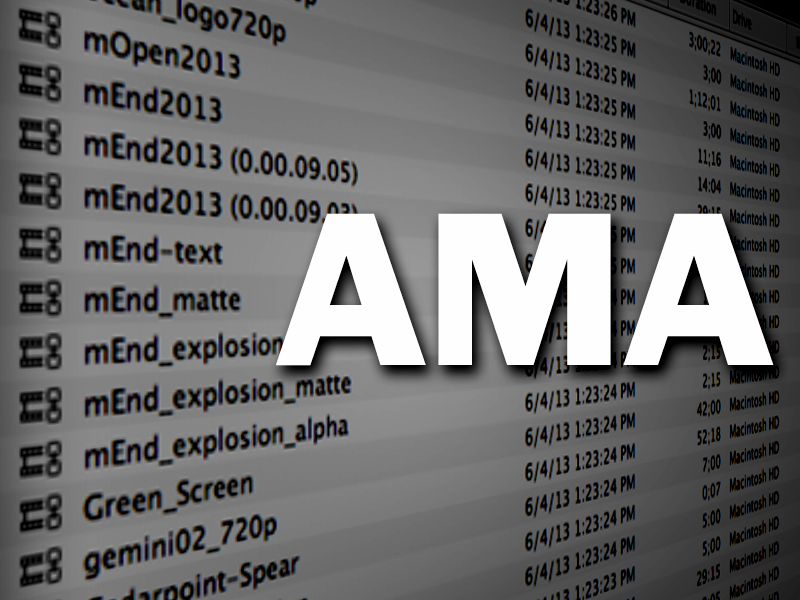 AMA is Avid's answer to how Apple Final Cut Pro and Adobe Premiere Pro have been handling media all along. Instead of importing media and converting it to it's native format, AMA allows editors to link to, and to play video clips from whatever location and format that they exist already. Since the early days of the Avid Media Composer, it was necessary to ingest all media before an edit could begin. 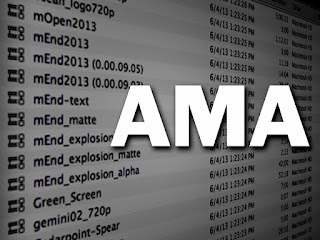 AMA allows the editor to begin without having to wait for media to be ingested. I read a criticism recently regarding AMA that it was an offline/online workflow. This is definitely true. Working with AMA, allows an editor to get started immediately, but seems somewhat impractical other than that. The time saved in starting to edit immediately, is quickly lost when anything needs to be rendered or an output is required for encoding/review. My workflow is this, I link to the AMA and begin the edit. As soon as I can, usually during a lunch break or in the evening when the machine is not in use, I take the opportunity to transcode the footage to Avid's native DNxHD media. As fast, as AMA is to ingest, the Avid editing system is much more efficient when working with native media. If media management is important to you, nothing beats the Avid system. Avid tracks and finds all the media so an editor doesn't have to. If I haven to ingest or render any material to the wrong drive, I can move it at the desktop level and the Avid system will figure out where the new media is. The resulting error when trying to export AMA as a Quicktime reference movie. I'm hoping that some day Avid figures out a way to export a Quicktime reference movie of an AMA sequence. I understand why it's not done, but for AMA projects with very little or no compositing, being able to export a reference movie would make the whole workflow run much quicker. The Avid editing system has always been great when it came to exporting Quicktime reference movies. Quicktime reference movies in Avid export instantaneously and take up no additional space on the drive. I'm looking forward to Avid Media Composer v7 when I can at least have the system transcode all the material in the background, while I continue to edit.